Investment in IT hardware by public cloud providers is growing faster than by any other type of hardware buyer. Money they spend on cloud data center expansion is the single biggest revenue-growth driver for servers, storage, and network hardware vendors, according to a new report by the market research firm IDC. Total investment in public cloud IT infrastructure is less than half of investment in hardware for non-cloud IT. Non-cloud IT investment, however, will remain flat this year, while public cloud IT investment will grow by nearly one-third, according to analysts’ expectations. The amount of money companies spend on non-cloud IT continues to be enormous – far greater than cloud-infrastructure spend – but users increasingly augment their in-house IT infrastructure with cloud services. As cloud user base and variety of cloud services grows, so does investment in cloud data centers. For cloud service providers, expanding data center infrastructure is also matter of staying competitive. Geographic scale and computing capacity are crucial attributes of a quality cloud service, so competition in the market is driving a lot of data center spending. Some of the biggest and most recent new cloud data center announcements included Amazon Web Services’ plan to build data centers in India, Oracle’s future data center in Brazil to support its cloud software services, and Microsoft’s plans to establish the first two Azure cloud data centers in Canada. Those are just a handful of the multitude of cloud data center expansion projects announced this year. Another major growth area is investment in hardware for private cloud infrastructure. IDC expects companies to spend $11.7 billion on this kind of infrastructure this year, which is a nearly 17-percent increase year over year. Public-cloud hardware spend this year will total $21.7 billion, or 32 percent up from 2014, according to IDC. The analysts expect companies to invest $67 billion in hardware to support private clouds, which, as already mentioned, is about the same as last year. 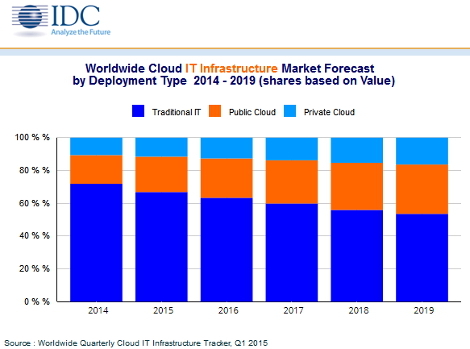 IDC’s five-year forecast sees public and private cloud IT spend grow at a compound 15.6 percent annually, and non-cloud IT spend decline 1.4 percent a year.